The only bad thing about making pirogies is rolling the dough. So I have found an easy way to make them using empanada wrappers. First I boiled a few potatoes in their skins, grated some hard cheese (it should be Sharp Cheddar but use whatever hard cheese you can find). 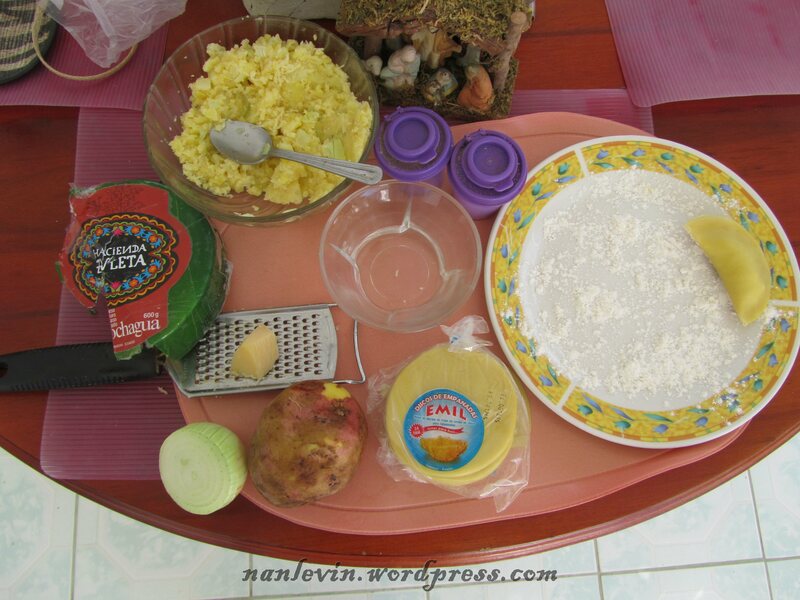 Saute an onion in butter until the butter is infused with the onion flavor, if you have a ricer, rice the potatoes, if not mash the potatoes with a fork, adding cheese and cooled butter onion mixture. Season with salt and pepper to taste. Take one of the empanada wrappers and add a teaspoon of potato mixture, with your index finger add a small amount of water to the entire edge and then fold the wrapper to cover the potato mixture. Set aside until all empanadas are filled. Bring a large pot with water to a boil adding a tablespoon of salt right before you add your pirogies. 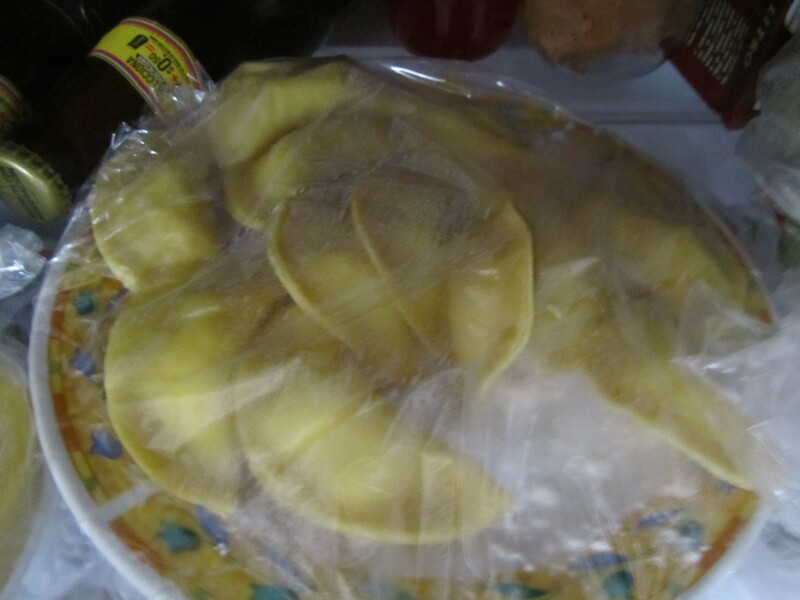 Drop 6 to 12 of the pirogies into the boiling water. Allow to cook for approximately 8 minutes. They will rise to the top during cooking. Drain and serve with more onions sautéed in butter. These can be filled with almost anything from sauerkraut, farmer cheese, fruits and even cooked meat. And you can top the savory ones with sour cream and the sweet ones with whipped cream for a very nice dessert. Or, add the potato pirogies to your favorite soup – yum! This is something I learned from my friend Eva. What a heavenly and filling soup with pirogies. 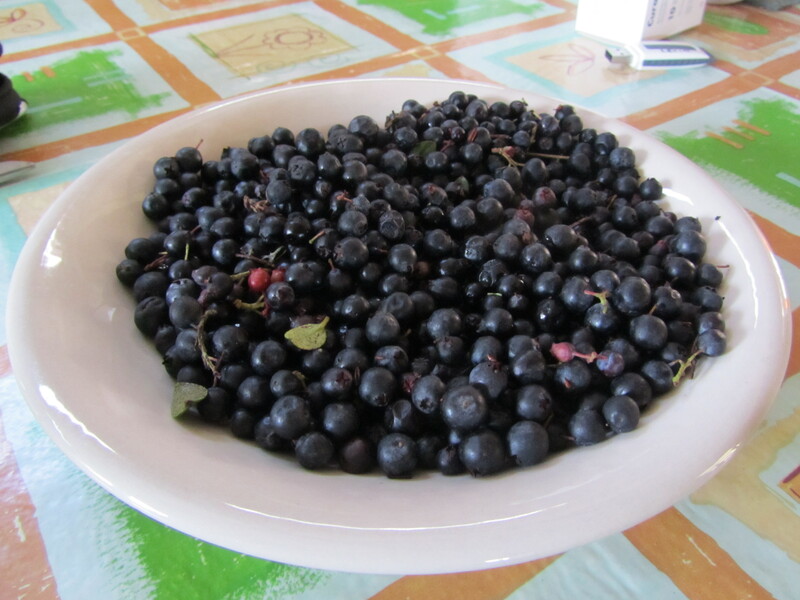 We found blueberries at the mercado back in November, sorry I am just getting to these pictures and story now. They are small like the berries we picked as kids from those low bushes in the mountains of Pennsylvania. The flavor is good very berry-like but not sweet. I picked up only a half a pound my first attempt because I really was not sure if they were blueberries. They only could be found in the mercado for a few weeks as I found out these are used in making the Colada Morada for the holiday Day of The Dead, once the holiday was over the blueberries disappeared. 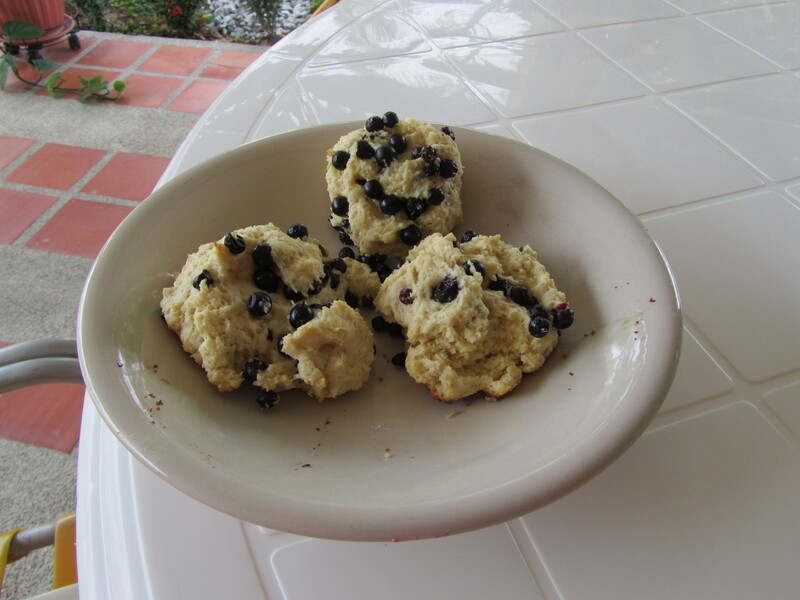 Joe and I both spent what seemed like hours cleaning the twigs and leaves out of them, then I made blueberry muffins, they were a big hit. My oven does not seem to heat properly and I have looked all over for a temperature gauge, the one that hangs from the shelf but to no avail as it is not something found in even big stores in Guayaquil. 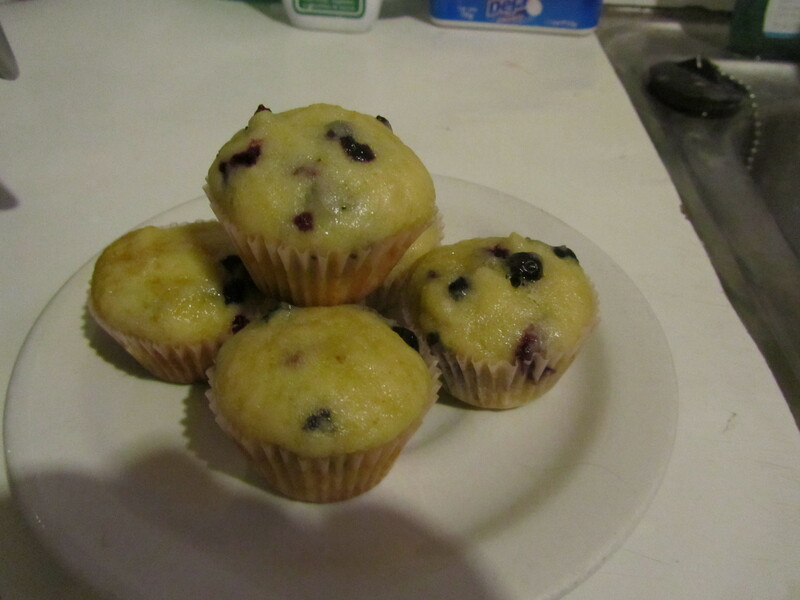 The muffin tops are not that pretty crunchy crusty with the great color, but they are blueberry muffins. 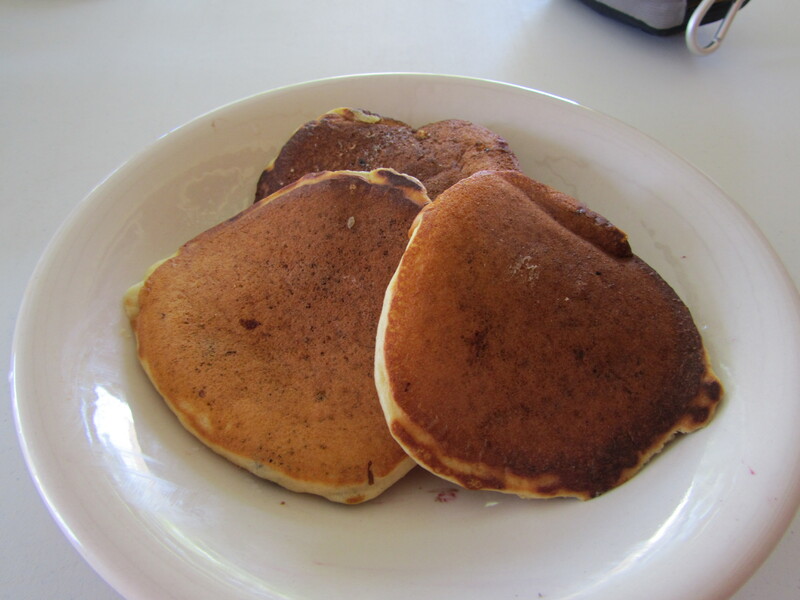 Then I made pancakes, sorry you cannot see the blueberries as I dropped them on the batter when already poured into the pan, I do not like blue pancakes. Then the last thing I made were biscuits this is a great recipe for Southern Biscuits and White Sausage Gravy but this time I put the blueberries in and made a blueberry sauce to pour over the top. Yes, it was fine! Now for the recipes: Many of my basic recipes are taken from an old Betty Crocker’s Cookbook that I received as a shower gift back in the early 70’s. I have made a few changes nothing major as these recipes are timeless in my opinion. Beat egg and add next six ingredients until smooth. Grease heated griddle or pan. Pour batter on to hot pan and add a sprinkling of blueberries. Turn when you see bubbles on the surface. Cook other side until golden brown. Make a simple syrup of water and sugar add blueberries and cook over medium heat for a few minutes. Remove and blend. Serve at room temperature. Mix all ingredients with an electric blender. Store in closed container in a cool dry place. Add mix and buttermilk mix well and add blueberries and gently stir. Bake at 425 F oven. Make a blueberry simple syrup to pour over backed biscuits.